My Spring season starts with Valentines Day. All those fresh roses being bought all around the country – maybe a bunch here and there ends up hanging in an airing cupboard to dry once it is past its best. Dried roses are a great way of keeping a romantic memory alive that little bit longer. Then about a month later it’s Mothers Day. More bouquets to be dried, but the nature lover might be out in the fields looking for the first primroses of the year. Pressing garden-grown daffodils & primroses is a great project for small children for Mothers Day. Another kids dried flowers craft project is making a no-sew lavender bag. Even better for small fingers is a no-sew, no-tie lavender bag! At Easter in the UK, we are all in hope of getting out into our gardens in the improved weather. 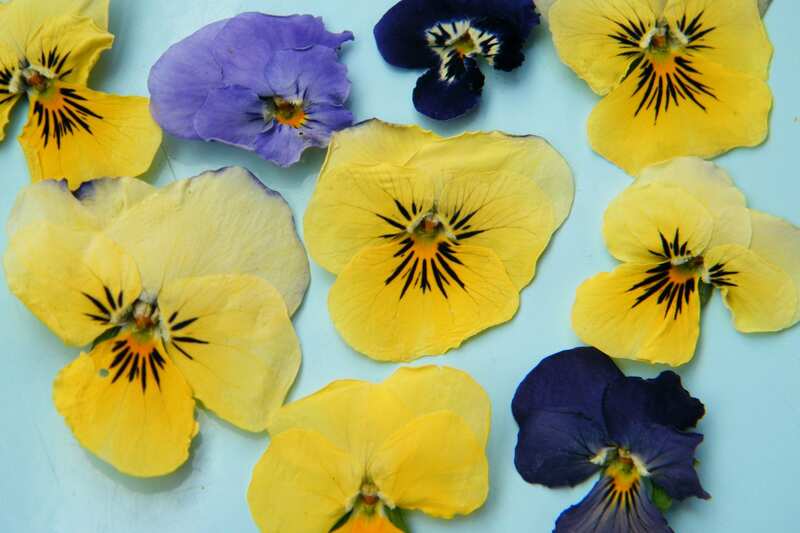 I love the little faces of violas and plant as many as I can at this time of year, and put quite a few in my flower press. Last year I also tried using them to make crystallised flowers. 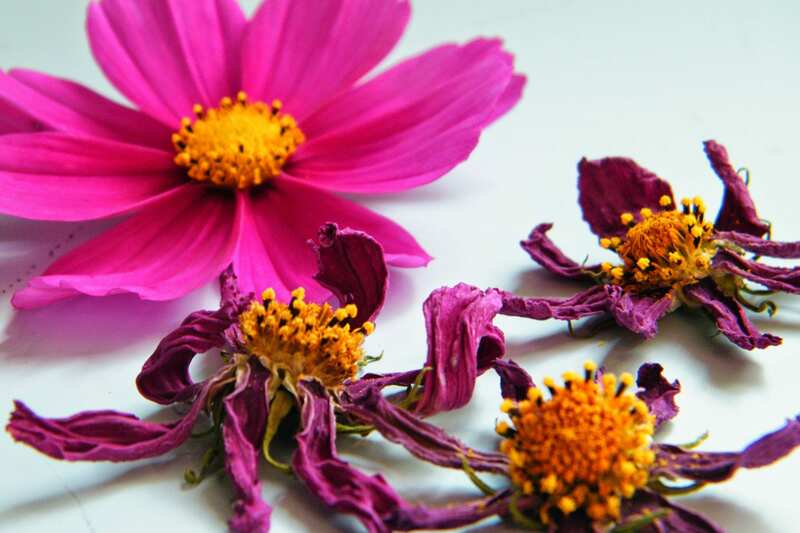 Spring is the time for sowing dried flowers seeds – here is an article about growing flowers for drying. Spring also marks the start of wedding season, and I have brides contacting me daily for advice about dried flower wedding bouquets, buttonholes and bridesmaids bouquets at this time of year. Country-style wedding themes are all the rage and this then spills over into lavender bags as wedding favours, dried flower confetti and decorations. Specifically, dried lavender forms the basis of many a wedding theme. In the summer, there are fresh flowers to pick from the garden. My favourite flower at this time of year is a rose called Rosa Mundi with beautiful pink stripes. Pick and dry some rose buds and rose petals to make natural dried flower confetti or potpourri. There is a long list of flowers you could dry by hanging in an airing cupboard, such as lavender, limonium, or cornflowers. Or dry some scented leaves to fragrance a room. Summer is the best time of year for potpourri making from fresh ingredients. As the last of the summer flowers fade in the garden, it’s lovely to preserve the last few blooms. Drying hydrangeas is very popular and easiest at this time of year. The cosmos in my garden bloomed into November last year, and I dried some of the last flowers in my airing cupboard to use as a potpourri topper. Drying cosmos. Winter means dried fruit and spices rather than dried flowers as such, so I guess the term should be “Winter botanicals”. I suppose this must be a remnant of times when food would have been more spiced over the winter months for preservation and/or to disguise not entirely fresh flavours. I love the cinnamon sticks, dried oranges, star anise, cloves and rose hips that dominate crafts at this time of year. Over the Christmas period, there is seasonal potpourri to be made, fragranced cinnamon bundles, as well as cinnamon and orange slice decorations and garlands and cinnamon cones.